Brunswick and Chilworth are delighted to be offering this lovely three bedroom end of terrace property situated within the Inner Avenue area of Southampton. In close proximity of the city centre is ideally placed for commute to both the city and motorway links via The Avenue. The property is very well presented throughout having undergone a full refurbishment around 18 months ago. This included new kitchen and bathroom of which were both fitted to a high standard. Large living room to the front of the property, wood laminate flooring and walls decorated to a neutral colour. The dining room is situated in the middle of the house with window facing garden, Also laid to wooden laminate and neutral decor. Galley type kitchen, newly fitted 18- 24 months ago, hard flooring and built in hob and oven. A small room designed as either utility or study between kitchen and downstairs W/C. Not currently used by the occupying tenants but would be ideal as either utility or small study. Small downstairs toilet and wash hand basin situated to the rear of the property. Access via door from utility room. Laid to decking and artificial grass is an ideal low maintenance area to enjoy a BBQ or some outside space. Also has a brick built out building to the rear. Fairly large entrance hallway laid to wooden laminate, stairs and landing laid to grey carpet. Also benefits from under stairs storage. Very large master bedroom going right across the front of the property, laid with grey carpet and decorated in neutral colour. 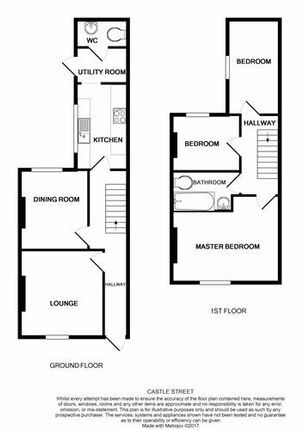 The two further double bedrooms are fairly equal in size. One is situated above the dining room over looking garden other bedroom to the rear of the property. Both laid to grey carpet and neutral decor. Modern family sized bathroom adjacent to the master bedroom. Modern three piece white suite with shower over bath. Modern water fall type tap fittings. Viewing is highly recommended on this property to appreciate the condition in comparison to others on the market in this area.